What Was Call of Duty: Devil's Brigade? 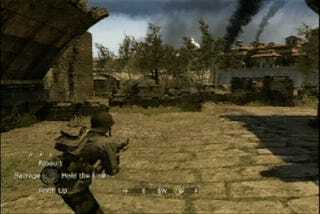 We've got a sighting of what may be a World War II Call of Duty game that was built for the Xbox 360. The website for visual artist Terry Allen shows three brief clips from what Allen refers to as a " a COD game called Devil's Brigade set in Italy in WWII." The clips are intended to show Allen's effects work and appear to depict both first and third-person action. On-screen controller prompts indicate support for basic squad-based commands: Assault, Barrage, Hold the Line and Form Up. The squad commands are shown using the image of an Xbox 360 controller's d-pad. One screen-shot shows the player being directed to order one of their fellow soldiers to execute a stealth kill. Allen's site indicates that, from 2007 through early 2010, he worked on Guitar Hero and this Call of Duty project as an employee of Underground Development, the studio formerly known as Z-Axis, that created Guitar Hero: Van Halen in 2009. He describes "Devil's Brigade" as his first project at Underground, which suggests that the game was put aside some time before Van Halen was made. If Devil's Brigade was real, it's vanished now. Kotaku has checked in with Allen and Call of Duty publisher Activision for more details and will let you know if we hear any.